Introducing the music of Alexandre Traube! Daniel Hertz is proud to introduce the music of Alexandre Traube, a composer, conductor and specialist in early European church music. Based in Switzerland, Traube is the founder of the Choeur In illo tempore and the Ensemble Flores harmonici, at the head of which he has pursued his passion for religious music from both Western and Eastern traditions for the last twenty years. 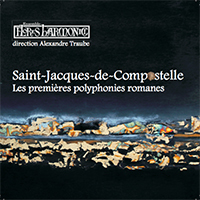 Now available are “Saint-Jacques-de-Compostelle” (single disk) and “Victoria: Vêpres inédites” (2 disk set), recorded in churches with some of the best acoustics in Europe. Compostelle (recorded at Abbaye de Bonmont in Switzerland). The disk features twelfth-century works found in the famous Codex Calixtinus preserved at St-Jacques-de-Compostelle, the mythical pilgrimage site in north-western Spain. It is one of the miracles of Compostela to have recorded some of the most profound music ever produced by western Christendom, songs which at the time were both a complete novelty and the expression of timeless mysticism.